Building a fulfilling and productive life - much like building a solid, durable house - requires the right materials on a solid foundation. 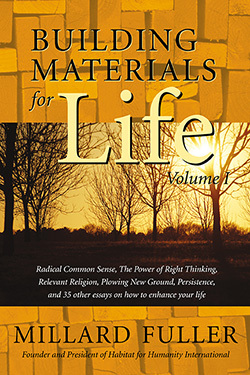 Building Materials for Life, a collection of 40 inspiring essays, will motivate you to gather the resources you need to succeed in life. Learning from Failure, Overcoming Doubt, Forgiveness and Peace Within are just a few of the raw materials that will ensure the success of your life's building project. I laid a foundation, and someone else is building on it." Millard Fuller was the founder and president of Habitat for Humanity for 29 years prior to founding The Fuller Center for Housing in 2005. Fuller’s business expertise and entrepreneurial drive made him a millionaire by age 29. Then, after a re-dedication of his life to family and to following God’s path, Fuller and his wife, Linda, decided to sell their possessions and give their money to the poor. Following mission work in Africa, the Fullers founded Habitat for Humanity in Americus, Georgia, in 1976. In Building Materials for Life, Millard Fuller uses specific events from his own remarkable life to provide humorous and incisive advice— helpful for every reader. Building Materials for Life is an impressive collection of essays and I’m sure they will be of help and guidance to many people.